Someone who is accused of murder is likely to spend a significant time locked behind bars. If that person murdered is a child, then the case is that much more severe and emotional. If that person accused of the murder is the child’s very own mother, then the case at hand is completely disgusting. Such was the case of Casey Anthony and her alleged murder of her own 2-year-old daughter Caylee Anthony. Just now, Casey Anthony walked a free woman. At 12:08 am, Anthony exited the Orange County prison in Florida. She walked out next to her attorney Jose Baez and two police officers. Dressed in long sweatpants and a pink top, Anthony and Baez got into an SUV and disappeared into the night leaving behind over one thousand people and dozens of television cameras there to capture her release. 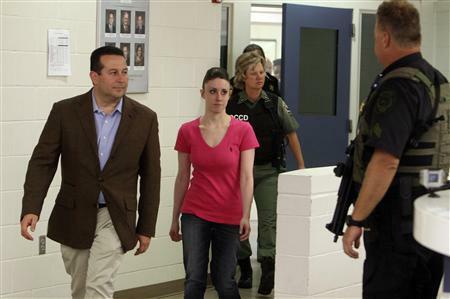 It is unclear what lies ahead of Casey Anthony. She has received many death threats in recent days because most of the nation believes she is a murderer. With the great amount of resentment towards Casey Anthony, it is fair to say that she will not be able to return to her former life. Whether Anthony goes into a new life where she would be provided protection or if she must go into the world on her own, the future of Casey Anthony does not look bright despite her release. Whether or not she killed her own daughter, the aftermath of the case is going to follow her until her dying days. Jose Baez is just trying to get in Casey’s pants I bet! That dirtbag! Anyone feel me? she was not wearing “long sweat pants” she was wearing jeans. They were more like Jeggings Amy. Not quite jeans.